Live stream: President Trump and the President of the European Commission Deliver Joint Statements. July 25, 2018 President Trump presses European Commission President on trade. The basis of the EU are farm subsidies. BRUSSELS CAVES TO TRUMP OVER "TRADE WAR"
July 1, 2018 President Trump's Full Interview with Maria Bartiromo. June 12, 2018 President Trump explains dust up with Justin. 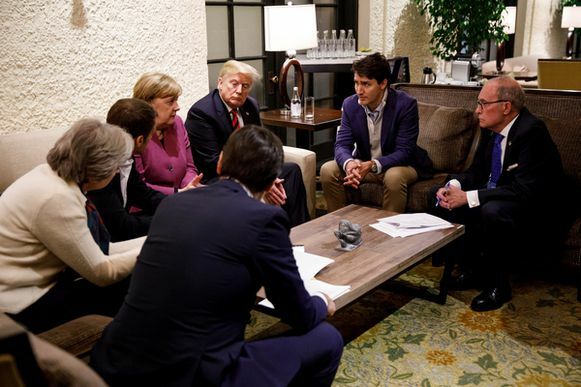 (VIDEO) TRUMP TELLS G7: GLOBALISM IS OVER! June 9, 2018 President Trump delivers post G7 statement. 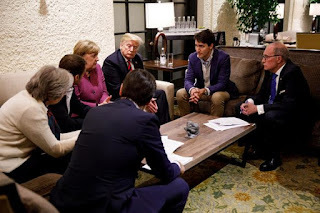 ⏩ Here's a brilliant report on the Charlevoix G7 agreement and Justin's statement on the Conservative Treehouse (more). ⏩ Great thread by Rex on Europe, France in particular. ⏩ Merkel's personal photographer Jesco Denzel took this picture that went viral after Merkel spokesman Steffen Seibert posted it on Twitter. 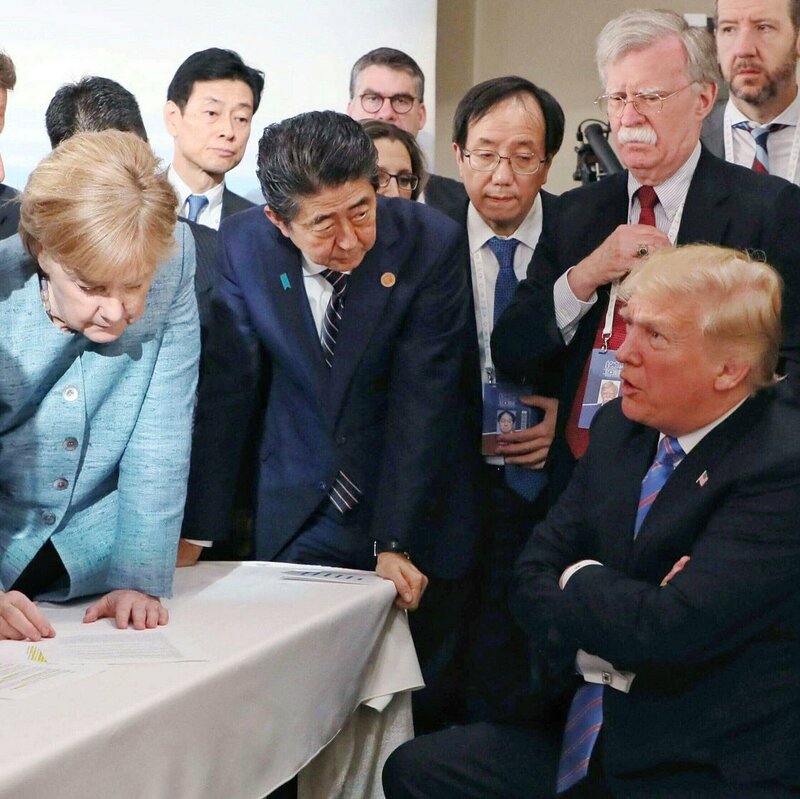 The idea was apparently to create the perception that Merkel was dominant in the talks, and that Trump, seated on a lower level was given a good talking to. Which provides us with a teachable moment about creating perceptions. Other pictures, taken before and after this specific moment create another impression. Honest observers will note in a glance what's actually going on here. Our caption is: "that awkward moment when Trump tells the tariffs and subsidy addicts that they've had their final shot". Trump won't endorse G7 statement. Accuses Trudeau of false statements. "We're the piggy bank everybody is robbing. And that ends"
April 11, 2018 Laura Ingraham talks to Gordon Chang. Chinese President Xi on Tuesday (Monday night in the U.S.) promised to open the country’s economy further & lower import tariffs on products including cars, in a speech that comes amid rising trade tensions between China & the US. President Trump explains in one single tweet why what is called "free trade" is actually the redistribution of wealth from developed countries to developing countries. This is how globalists think. The world's wealth is a zero sum game to them. It's world Socialism! On the other hand, imposing tariffs, as leverage in negotiations or as an instrument to counter unfair trade practices, is not "protectionism" but a healthy defense against globalist redistribution. As is the case with tariffs, President Trump signing Congress' spending Bill has many Trump supporters distraught and confused as to the President's goals and motives. Equal and fair trade is easier to explain than a boondoggle of a spending Bill that is putting Obama era Omnibuses to shame. After 48 hours the synapses have started working again and the reality why the President signed off on the Bill are slowly becoming apparent. After more than a year in office, some of the more ideological followers still have not learned to trust their President. There is always a very good reason why he is making the choices that he does with American interests first in mind. In the threads are a number of ideas, for what they are worth at this point, because neither can be verified at this stage. Clue: it's a spending Bill, not a budget. Our Stable Genius can spend as he wants, slow walking funding of Planned Parenthood, or holding back until the Senate finally confirms his appointments. All right. So here's what's going on. The reason we are reading about aircraft FAILING IN THE AIR and killing service members every other day is because Obama slow walked/held back military money, even what was supposed to be appropriated. He deliberately underfunded our military to send the $ to his priorities. Live stream: The White House - President Trump Signs the Section 232 Proclamations on Steel and Aluminum Imports. Today in a meeting with steel and aluminium representatives President Trump is expected to officially announce import tariffs of 25 percent for steel and 10 percent for aluminium, applicable two weeks from now. The President is reserving the right to make exemptions, as will probably be the case for Canada and Mexico, currently renegotiating NAFTA trade agreement with the Trump administration and close allies, like Britain and Australia. March 8, 2018 Wilbur Ross: Trump tariff plan is about economic, national security. The EU last year hiked tariff on steel from China by 36%. Trump setting a tariff of 25% on steel offers the Left an opportunity to demonize Trump. Free traders labored under the utopian notion that one sided WTO agreements with China would automatically translate into political freedom under Communist rule. How stupid can you get? Krank up the #tariffs !